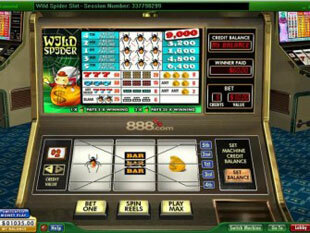 Wild Spider is very simple 3 reel 5 payline slot machine. Developers of this video slot did good job: they implemented the game that is easy to understand. But at the same time creators didn’t forget to add some useful features that make the gameplay more interesting and fun.The graphics is clear, smooth and realistic. It doesn’t contain any outstanding creations, but the machine gives the feeling of real 3D playing at classic slot machine. The sound is also nice. It contains pleasant melodies and tones of casino pastime. There are not a lot of symbols in the game withal the last one has 5 different paylines. It definitely increases the winning chances. The minimum coin denomination is $0.05 while the maximum one is $2.00. The maximum bet is 5 coins per spin, therefore max bet is $10.00 – that allows to win top jackpot of $9,000. So such high potential for serial winnings and accessibility made this classic 3 reel slot machine rather popular on European, Canadian and Australian markets. The wild symbol in this game, as you may dawn upon, is a spider. It appears on all reels and can substitute any other icon. This is not the only one benefit from this symbol. When a spider appears in the winning combination the award is doubled. In case two wild symbols are hit the winnings are quadrupled. There aren’t any scatter symbol or bonus feature or free spins or random progressive jackpot at this classic slots. But in my opinion Wild Spider allows to have a rest from features packed 5 reel 20+ paylines video slots. This is a good exemplar for other developers how a couple of features can make classic slot machine interesting, fun and well-known. Great choice for those who is looking to play simple 3 reel slot.